The fourth grade curriculum revolves around the EIC curricular framework. Three project-based units use the local environment and community as an integrating context for learning. These hands-on, integrated community investigations engage us in real-world explorations of natural and social systems. Fourth grade students study the relationship between a community’s resources and its impacts on the waste stream, types of energy and alternative energy sources, and pest management practices. 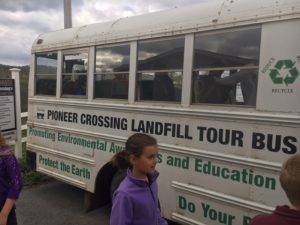 Students learn about the different types of waste streams and follow these waste streams in the community to determine the systems involved in the processing and disposal and possible reuse of liquid and solid waste. Students visit local land fills, waste disposal and recycling centers and waste water treatment plants to investigate waste streams and disposal practices firsthand. The unit also focuses on energy use throughout the waste stream, comparing the inputs and the outputs. Students will develop an understanding of sustainable waste stream management and how their personal actions lead to energy use and/or conservation. Students create action plans to increase community awareness of the waste stream and reduce the overall contributions into the waste stream through various practices. In this unit, students define what energy is, where it comes from, and forms of energy. The scientific method is utilized to explore potential and kinetic energy as well as creating circuits. Students differentiate between nonrenewable and renewable energy resources and analyze the impacts of electricity and then explore alternative energy resources, such as solar, wind, water and biofuel. Students will study local community energy use and create proposals for energy conservation to benefit sustainability of our resources. This investigation begins with defining habitat and niche and identifying local natural habitats that occur within a mile of our school campus. Students then identify human activities that impact organisms and what causes a human to classify something as a pest. Students identify pests in our local community, both plant and animal, and learn about methods of pest management, both chemical and best management practices (BMP), as methods to decrease pests in various environments. Students create a plan to promote BMP in the local community.